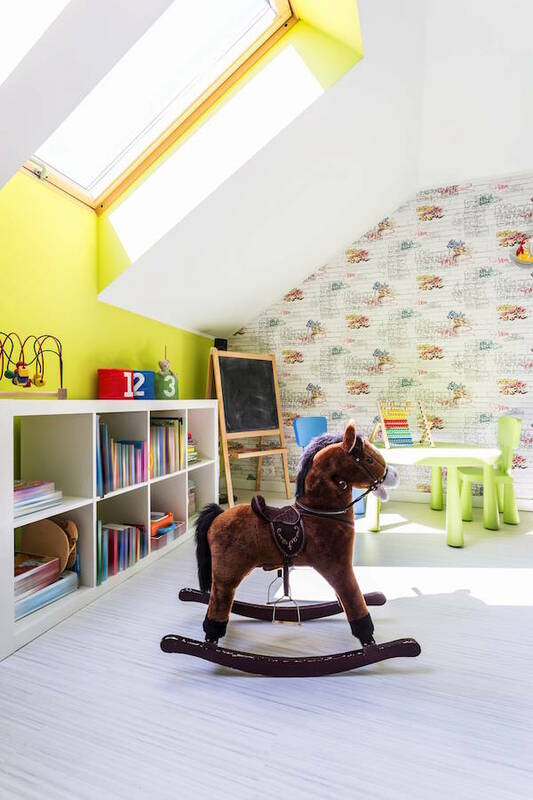 We can create a kids playroom loft conversion so your children can enjoy playing with their toys in their own space. Having a separate kids room also means that the mess and noise is kept to one area of the house! Every time they pitter patter up to the top of the house, an adventure has begun. They can instantly start to use their imaginations in their own personal playing universe and have fun! Safety is paramount to us at Sky Blue Lofts and so we will adhere to the necessary building regulations for your specific attic conversion. The stairs access will also be carefully planned. A door needs to be fitted at the top of the playroom stairs, and clearly, a lockable gate must be used for younger children. If your conversion is to have low level windows then these must also be lockable. Children certainly do grow up fast, and their interests change quicker than a teenagers mood! Therefore, make consideration to the layout and functionality to the kids playroom you are having fitted for your loft conversion. Think about electric points for plugging in the necessary ‘teen-ear-drum-bursting’ speakers, enough sockets to charge the zillion devices, hair tongs or beard grooming contraptions (yes, we said beard – we said they grow up quickly!). An area for quiet time is also a good idea, such as a small desk or wall mounted drop leaf table. In the first instance, get your kids on board with the design and let their imagination run wild. Use a blank cork board for them to pin pictures, materials, lists etc and then get them to draw a picture of what they want their new play area to look like. Clearly, you won’t fit a 10ft T-Rex in most lofts so a few reality checks along the way will be needed! Themes are good for smaller children, you can keep to a neutral painted colour scheme then use accessories and furniture to make the room a magical place. Making clever use of the available storage is essential. So utilise the eaves to make cupboards and maybe a bespoke storage cupboard at one of the gable ends to make sure everything can be quickly and easily packed away at the end of the day. 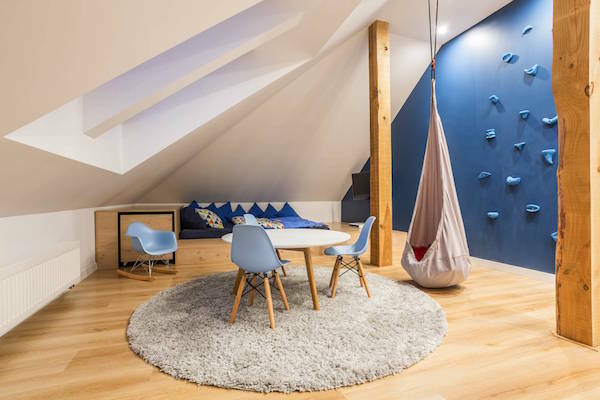 But of course the loft needn’t be just for younger kids to play in. For older children, i.e., teenagers, a chill-out room will be a huge hit. Painted in ‘cool’ colours a chill-out room with a desk and PC for Internet surfing and, grudgingly, homework together with TV (complete with Sky of course), sound system and soft furnishings such as bean-bags will be somewhere your teenager loves to be. Include a sofa bed for sleep-overs and you have a teenagers paradise. Tip – make sure you sound-proof the floor or buy a stereo system without a ‘mega-bass’ control. In fact, you would probably be better off doing both. Or buy a large stock of aspirin. Be prepared to see very little of your child. When we completed my daughters chill-out room the only time we ever saw her was immediately after school, meal-times and bed-time. The rest of the time was spent in the chill-out room and even homework got done – sometimes.